Maybe you watch the Boston Marathon every year, or maybe you’ve never been to see one. Whether or not you have a friend or loved one that is running a marathon, go watch one. Bring a sign, bring a noisemaker, or just bring yourself. 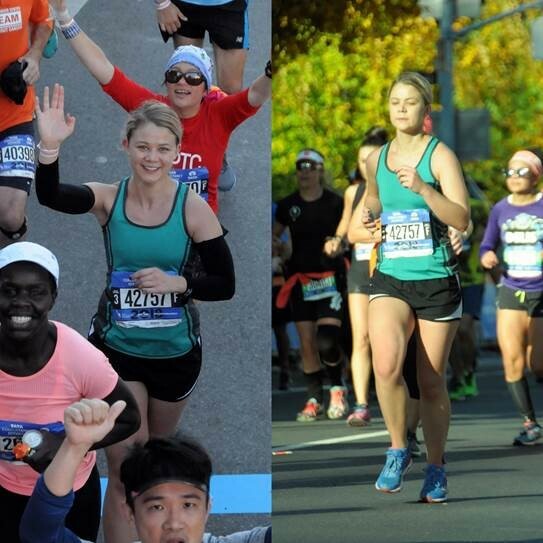 Here’s why: I ran the New York Marathon on November 4th and I would not have finished if it wasn’t for the spectators. I started off on the wrong foot (pun intended). I lost my headphones in the start village, found them again, almost missed my start wave because of it, and then realized that my headphones were broken and resigned myself to the fact that I would be running all 26.2 miles without the music or pacing help of my phone that I have come to depend on. That, combined with a minor ankle injury I had been nursing in the weeks leading up to the race, predicted potential disaster on what I had hoped would be my first sub-four-hour marathon. I ran the first 15 miles with no problem. It started to get more difficult after that, but every time that little voice in my head reminded me, “It’s ok, you can stop and walk for a bit,” I would see a funny sign, or someone would yell encouraging words at me, and it would keep me going. My ankle injury started acting up around mile 16 so I slowed my pace, and around mile 22 I hit a wall that felt like bricks and I stopped. At that moment I didn’t think it would be possible for me to keep running, but looking around I saw people gesturing toward me and yelling, “KEEP GOING, ONLY FOUR MORE MILES!” So I kept going, albeit at what felt like my slowest pace ever. Those last four miles were the most difficult thing I have ever done. I was encouraged by other runners, by people standing on the side of the road, and by the electric energy of everyone around me. I got a high five from a little kid wearing mittens, I saw people with funny signs, like one that featured a picture of Trump with the words “Run like he’s behind you!” I saw my friends who had come all the way from Detroit and Philly to support me, and my boyfriend, who had his camera (so I had to keep running so the shots would turn out well). Every time I stopped or slowed down in those final miles, someone in the crowd would yell to me and encourage me to keep running. While the New York Marathon was definitely not my best time, it is the race I am the proudest of. Despite having every reason to stop, I didn’t. I crossed the finish line of the biggest marathon in the world, along with 52,696 other runners, all thanks to every person who came out to support and cheer. So, next time there is a marathon near you, set your alarm clock, get up, and go! You never know how many people you could be helping to accomplish their goals with your words (or signs) of encouragement.